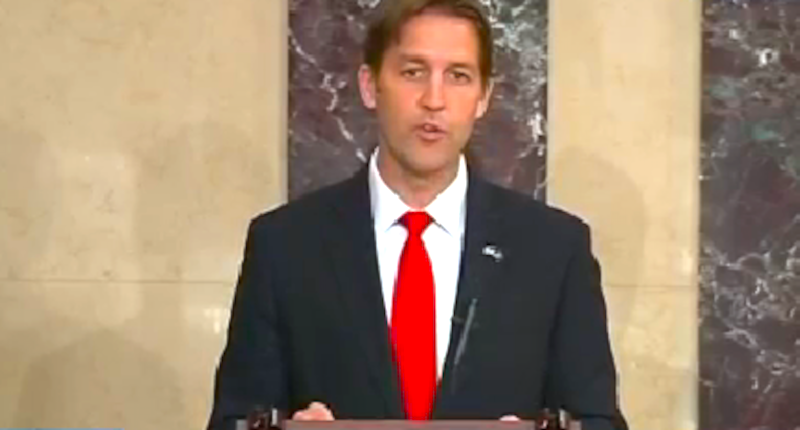 Nebraska’s freshman senator, Ben Sasse, laid into his colleagues from the senate floor last week, waiting a year to give his first speech. He didn’t waste the opportunity, blasting his senate colleagues for not doing their jobs, and reminding them that they work for the people, and some things are far more important than reelection. While the speech was much longer, MSNBC broadcast the high points, boiling it down to two minutes. Sasse is obviously very close to his constituents. He knows exactly how the people feel about the beltway circus. “The people despise us all! And why is this? Because we’re not doing our jobs! There are good and bad reasons to be unpopular. A good reason would be to suffer for waging an honorable fight for the long-term that has near-term political downsides — like telling seniors the truth, that they’ve paid in for their Social Security and Medicare is far, far less than they think and far, far less than they are currently receiving. The real reason the political class is unpopular is not because of our relentless truth-telling, but because of politicians’ habit of regularized pandering to those who most easily already agree with us. Guess what? Normal people think like this. They don’t like that we do and more important than whether or not they like us, they don’t trust their government because we do. It’s weird, because one on one, when the cameras are off, hardly anyone around here really thinks that senators from the other party are evil, or stupid, or bribed. While I am in favor of more civility, my actual call here is for more substance. This is not a call for less fighting . This is a call for more meaningful fighting. A six-year term is a terrible thing to waste. A two-year term requires hamster wheel frenzy. Our jobs do not. I think we can do better, and I pledge to work with all of those who want to figure out how.